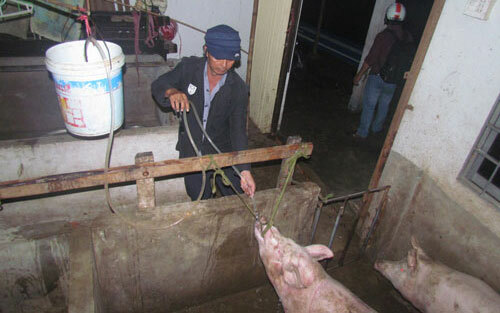 TIEN GIANG (VNS) — Tien Giang's Police Office on Environmental Crimes imposed a VND5.5 million (US$250) fine on pig store owner Nguyen Viet Long yesterday for violating the veterinary services and animal feed policy. Long was caught red-handed pumping water into pigs to increase their weight before transporting them to slaughterhouses. He had already pumped water into 30 of the 59 pigs at the scene. All of them had been certified by Ben Tre's Veterinary Department.